I am 32 years old and live in the city Centre of Rotterdam together with my boyfriend, his 7-year-old son Finn and Billy, our French Bulldog. I am a female-health entrepreneur: I am passionate about everything that has to do with female health and nutrition. By starting FITSHE ) I want to contribute to the active lifestyle of women for whom being physically fit serves to live life to the fullest. I cannot remember the first time I tried a protein shake, but I do remember how I felt about shakes in general. To me, protein shakes were for bulky guys who wanted to grow even bulkier the Arnies and their bodybuilding friends. Protein shakes were definitely not for me. Protein has this “heavy” image in The Netherlands and beyond, and especially among women. However, when you cross the border and go to London or New York you will find protein shakes in every juice-bar, and on almost all food in the supermarket you’ll find an indication of how much protein it contains. Probably you have the same on Ibiza. Why? Well, because proteins are the body’s building blocks. They’re essential for muscle repair and growth, but also take care of your hair, skin, nails and other tissues. So it’s important to make sure you get enough of them, especially when maintaining an active lifestyle. I learned that there is nothing scary about proteins; they are what your body needs to function properly. Personally, I believe first and foremost in fresh and non-processed foods. But living my full and active life requires some convenience too. When I learned about the importance and benefits of proteins (especially after training), I went looking for a 100% natural, yet convenient solution, to fit my lifestyle. Eating a piece of chicken or a bowl of quark after my training turned out to be neither the easiest nor the best option, as these foods take a while for your body to digest (so it takes longer for the nutrients to reach your muscles). However, all the shakes I came across did not fit my requirements either. So I decided to shake up my life and start my own business. I wanted to develop a product that women could trust and that would truly support an active lifestyle, without all the nasty and unnatural additives or bulky jars that did not fit inside my cupboard. Preparing my FITSHE shake after my training has become a new habit, and the good news is: I still haven’t turned into a green hulk. Protein has given me a lot: not only does it refuel my body after my training and make sure my efforts count; but it also turned my whole life upside down and before I knew it I was running a business in shakes. The FITSHE After Workout Shake is only the beginning, I am planning to launch more products that suit the 100% natural requirements, are based on (as many as possible) organic ingredients and suit the active yet busy lifestyle women have nowadays. Can you explain in short why protein is good for the human body and what it does? The feeling of hunger after your workouts often arises because your body needs nutrients to start your recovery. After your trainings, you need to replenish three essential elements of your body. Your muscles; your energy; and your water levels. To recover your muscles, it is essential to eat around 20 grams of protein, preferably within 30 minutes after your training. Protein breaks down into amino acids, which are the buildings blocks of muscle fibres. So without protein, you cannot repair those tears we talked about in your muscles. Eating high quality protein, either by itself or together with carbohydrate, enhances muscle protein synthesis. The body adapts and builds the molecules, cells, and tissues it needs for the next period of activity. Besides protein to recover your muscles, it is also recommended to eat some carbohydrates after training in order to fill your glycogen reserves. Without glycogen from food, the body will break down its own lean (protein-containing) tissue to get the amino acids needed. It is also from glycogen that the muscle fibre gains most of its energy to get ready for your next training. FITSHE After Workout Shakes contain the right amounts of 100% natural protein and carbohydrates to optimally recover your muscles, and even magnesium, which supports the recovery process. What is the difference between male and female bodies when it comes to training and nutrition? To a large extend our bodies function the same. Both men and women need protein after their workout to support their recovery process. Big difference is that men will easier bulk –up as a consequence of their testosterone levels. This of course depends to a large extend on the intensity and type of training and character & amount of the consumed meals. Women lack in testosterone (thank God!) and won’t get bulky from training and eating proteins (unless they eat and train a ridiculous amount). When it comes to female and male bodies, I am glad to see researchers pay more attention to the difference between them. Recently Queen Maxima opened a conference dedicated to the difference in health requirements for men versus women. More than 80% of the General Practitioners indicated that they feel there should be more focus on the distinction between men and women when it comes to medication and treatments. 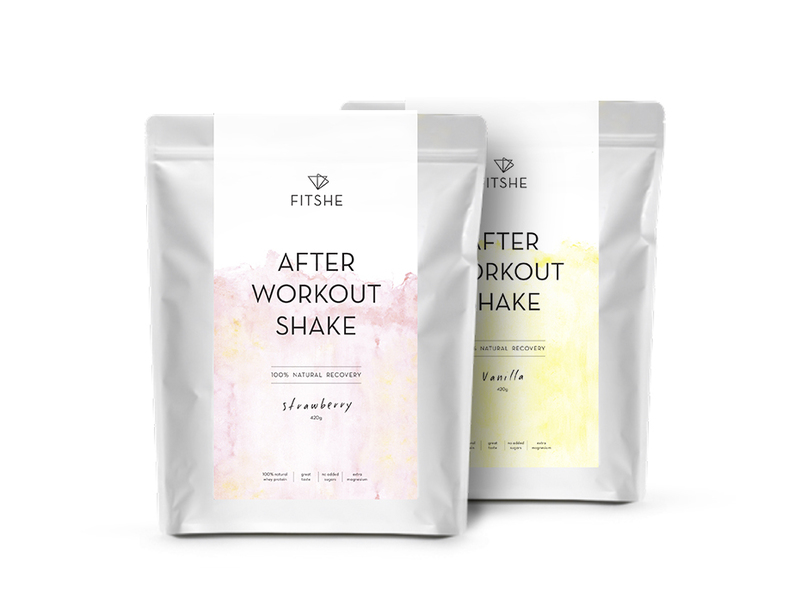 The FITSHE After Workout Shake is designed for the female body, as it contains 18 grams of organic protein per portion (men could use a little more, as they have more muscle tissue), 100% of your average daily dose of magnesium (which supports your recovery and protein synthesis) and it has a pure and clean taste. Having said that, many men are actually using FITSHE, as they like the taste so much (and don’t worry you will not get breasts J). What makes Fitshe different than all other proteins suppliers? First of all it is absolutely 100% natural and it does not contain any artificial sweeteners. To me that was a very critical point. Then I sourced the highest quality organic protein I could find (hence no hormones and happy cows), which has a great taste too. The flavouring comes from natural sources like cinnamon, vanilla and 100% fruit (freeze-dried). Finally I added your daily dose of magnesium derived from seawater. The 100% pure Organic Whey, has a neutral flavour. It is the best quality whey in its simplest form, a great way to add to your favourite recipes. We are super proud to announce that Fitshe is available at The Workout Club Ibiza. When you like to try this fantastic product out, send us an email at info@twc-ibiza.com and we will assist you with the speed of light.